Since the early 1960s Michael Twyman has contributed to the establishment and improvement of standards of academic teaching and research in the field of printing history and techniques. Students and visitors who have had the chance to participate in his weekly sessions at the Department of Typography & Graphic Communication at the University of Reading – a place that might not exist today without his persuasive work – know how nearly boundless his curiosity and expertise are when showing and discussing any printed material. Among many other topics, Twyman has specialised in the study of lithography, a subject on which he has published several authoritative essays and books. His latest work, A History of Chromolithography: printed colour for all, stands as the most comprehensive outcome of a life of foraging. 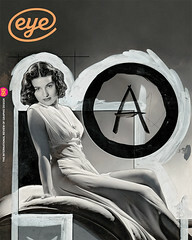 Each one of its 850 illustrations is compelling and appealing. It is divided into four parts. The first is a detailed narrative running over a period of 150 years (1818-1970). Twyman reminds us that the first attempts at colour printing in the West began almost as soon as Gutenberg invented movable type. Several methods were developed before the eighteenth century, yet, as Twyman says, for ‘chromolithography to succeed, certain commercial and technical conditions had to be satisfied.’ Increased demand for colour printing during the Industrial Revolution favoured the search for a more convenient and faster process derived from lithography. The names and contributions of Godefroy Engelmann in France and Charles Hullmandel in England are most prominent in this collective quest, which bore fruit in the 1830s and swiftly spread around the world. 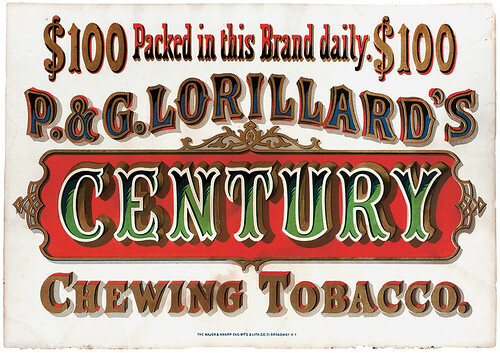 A showcard for chewing tobacco, New York, ca. 1870. 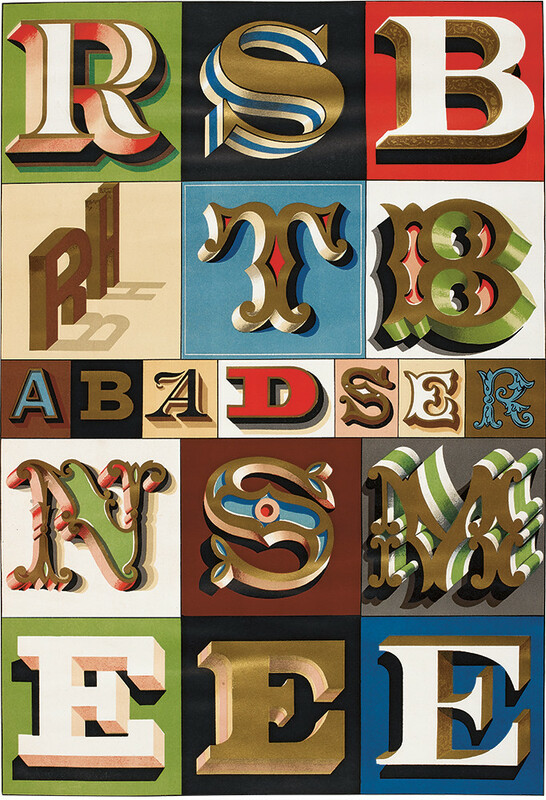 Top: ‘Examples of raised and shaded letters for glass and wood signs’, from The sign writer and glass embosser by William and William George Sutherland, (1898), reproduced in Michael Twyman’s A History of Chromolithography: printed colour for all. The second part presents the manifold developments of the craft, as well as the most important artists and printers who chose to specialise in chromolithography. Not only are ‘shadowy figures’ brought back from oblivion, but Twyman addresses the work of renowned poster artists such as Jules Chéret. The most impressive chapters in this section are, perhaps, those dedicated to the apprenticeship and training of young workers and to the description of the workplace. One can learn about the social aspects of this trade – particularly moving are photographs of workshops in Belfast in 1896 and Lyon in 1930, men seated in rows quietly drawing on their respective stones. The third part, ‘How chromolithographs were made’, explains in detail the materials, tools, machines and methods that were used and describes the successive stages of production. Another fascinating chapter, ‘Visuals and the visualizer’, sheds much-appreciated light on the task of adapting an original artwork to chromolithography. Even what could be seen as a painstaking chore – the registration of printing marks – becomes interesting in the author’s vivid, concise and enlightening account. Finally, Twyman categorises the various processes encompassed by the term ‘chromolithography’, from flat-colour work to the use of metallic inks. A glossary and a plentiful bibliography close this outstanding contribution to the history of printing. 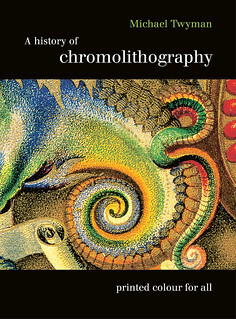 Cover of A History of Chromolithography.